Monday 28 January: NLI Reading Room and Manuscript Room closed all day to facilitate the Library's continuing redevelopment of the premises. Venue: National Library of Ireland, Kildare Street, Dublin 2. All other services/exhibitons/cafe, including Genealogy Advisory Service, will operate as normal. Monday 28 January: Irish lace, with Bernadine Nic Giolla Phadraig. Host: Clondalkin Historical Society. Venue: Arás Chronáin Irish Cultural Centre, Watery Lane, Clondalkin, Co Dublin. 8pm. All welcome. Tuesday, 29 January: The Irish Revolution, a preview screening of the 3-part documentary series based on the best selling Atlas of The Irish Revolution published by Cork University Press. Hosts: RTÉ and UCC. Venue: Cork Opera House, Emmett Pl, Cork City. Starts at 7.45pm. Tickets €5 (all proceeds to Cork Penny Dinners). The screening will be acoompanied by a Q&A session. Details. Tuesday 29 January: The 2018 Maine Ulster Scots Conference, with Helen Perry. Host: North of Ireland Family History Society, Causeway Coast and Glens Branch. Venue: Guide Hall, Terrace Row, Coleraine BT52 1HF. Free. 8pm. All welcome. Tuesday 29 January: Cork Archives closed. Seamus Murphy Building, the home of Cork City and County Archives Service, will be closed for the day due to works in the area. Open as usual on Wednesday. Tuesday 29 January: Ship Wrecks on the Iron Bound Coast, with Mick O'Rourke. Host: Kilrush and District Historical Society. Venue: Teach Ceoil, Grace Street, Kilrush, Co Clare. 8pm. All welcome. Members free/ non-members €5 on the door. Wednesday 30 January: The faith journey of the Deise People, with Rt Rev Monsignor Michael Olden. Host: The Julian Walton Winter Lecture Series. Venue: Dunhill Multi-Education Centre (opposite GAA Grounds), Dunhill, Co Waterford. 8pm. Lecture followed by Q&A and light refreshments. Fee €5. All welcome. Thursday 31 January: Family History Research Centre and Library open – an extra day. Host: North of Ireland Family History Society. Venue: Unit C4, Valley Business Centre, 67 Church Road, Newtownabbey, Co Antrim. (Free parking.) Hours: 2pm to 8pm. All welcome. Details. Thursday 31 January: Online sources for Irish Research, a webinar with Donna Moughty. Host: Santa Barbara Genealogical Society. Venue: Online Webinar. 1pm–2:30pm PST/9pm–10:30pm GMT. Register. Thursday 31 January: 'You are the light of the world. A city seated on a mountain cannot be hidden' (Matthew 5, 14): The beginnings of Cashel, with Dr Dagmar O'Riain. Host: Cashel Heritage Forum lecture series marking 700th anniversary of the building of the town walls. Venue: Parish Centre, Friar Street, St. Francisabbey, Cashel, Co Tipperary. 7:30pm. Free. Refreshments after lecture. Thursday 31 January: Online family and local history resources, workshop. Host and venue: Public Record Office of Northern Ireland, Titanic Boulevard, Belfast. 6pm to 8pm. Each workshop will start with an orientation tour of PRONI, followed by an introduction to searching online resources, and will help improve IT skills. Free, but you need to book. Thursday 31 January: Banished Beyond the Seas: NAI records of convict transportation to Australia, 1788-1868, with Joan Kavanagh. Host and venue: National Archives of Ireland, Reading Room, Bishop Street, Dublin 8. 6pm. Free. No booking required. All welcome. Thursday 31 January: Wills and Testamentary Records, with Natalie Bodle. Host: North of Ireland Family History Society, Ballymena Branch. Venue: Michelin Arts Workshop, Braid Arts Centre 1-29 Bridge Street, Ballymena, BT43 5EJ. 7:15pm. All welcome. Friday 1 February: Access restrictions at the RCB Library. No access to the Archives and Manuscripts Collections on Fridays (on-going). Access to Printed collection not affected. RCB Library, Braemor Park, Churchtown, Dublin 14. Details. Friday 1 February: Commemorating the Revolution, with Rory O'Dwyer. Host: Michael Collins House. Venue: Parish Centre, Western Rd, Maulnaskehy, Clonakilty, Co Cork. 7:30pm. All welcome. Free. Monday 4 February: NLI Reading Room and Manuscript Room closed all day to facilitate the Library's continuing redevelopment of the premises. Venue: National Library of Ireland, Kildare Street, Dublin 2. All other services/exhibitons/cafe, including Genealogy Advisory Service, will operate as normal. Monday 4 February: The Archaeology of Derry, with Ruairi O’Baoill. Host: North of Ireland Family History Society, Foyle Branch. Venue: Lecture Room, Derry Central Library, 35 Foyle Street, Derry, BT48 6AL. 7pm. All welcome. Monday 4 February: Francis Hutcheson and Early Saintfield, with Martin Todd. Host: North of Ireland Family History Society, Killyleagh branch. Venue: Killyleagh Masonic Hall, 50 High Street, Killyleagh, Co Down, BT30 9QF. 8pm. All welcome. Wednesday 6 February: Workshop Evening. Host: North of Ireland Family History Society, Tyrone Branch. Venue: Local History Section, First Floor, Omagh Library, 1 Spillars Place, Omagh, BT78 1HL. 7:30pm. All welcome. Wednesday 6 February: Irish family history resources on the Internet, with Peter Christian FSG. 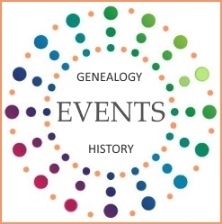 Host and venue: Society of Genealogists, 14 Charterhouse Buildings, Goswell Road, London EC1M 7BA. 2pm–3pm. £8. Booking. Wednesday 6 February: DNA: Family Finder 1, with Martin McDowell. First of three sessions (continues on Tuesdays 12 & 19 Feb, note different day of week). Host: North of Ireland Family History Society. Venue: NIFHS Research Centre, Unit C4, Valley Business Centre, 67 Church Rd, Newtownabbey, Antrim BT36 7LS. 7pm – 9pm. Booking required. Cost for the three sessions £18, payable at the first session. Details. Thursday 7 February: DNA: Family Finder 2, with Martin McDowell. First of three sessions (continues on 14 & 21 Feb). Host: North of Ireland Family History Society. Venue: NIFHS Research Centre, Unit C4, Valley Business Centre, 67 Church Rd, Newtownabbey, Antrim BT36 7LS. 7pm – 9pm. Booking required. Cost for the three sessions £18, payable at the first session. Details. Thursday 7 February: Practical Workshop - Get started: advice on searching for records at PRONI. Host and venue: Public Record Office of Northern Ireland, Titanic Boulevard, Belfast. 11am to 1pm. Free, but booking essential. Early booking recommended as these workshops are usually snapped up quickly. Register. Thursday 7 February: Accidental Damage, Fire and Theft: Irish Public Records before 1922, with Dr David Brown. Host: Library Assoication of Ireland Rare Books Group. Venue: Royal Irish Academy, 19 Dawson Street, Dublin 2. 1pm (follows AGM). Free. All welcome. Friday 8 February: General Sir Edward Bulfin – Ireland's forgotten general of WW1, with General John Powell. Host: Military History Society of Ireland. Venue: Griffith College, South Circular Road, Dublin 8. Free. Non-members welcome. 8pm. Friday 8 February: Access restrictions at the RCB Library. No access to the Archives and Manuscripts Collections on Fridays (on-going). Access to Printed collection not affected. RCB Library, Braemor Park, Churchtown, Dublin 14. Details. Saturday 9 February: Destination Canada, a free mini conference exploring the Irish, Norwegian and Romanian migration experiences, and Canadaian immigration resources. Host: Minnesota Genealogical Society. Venue: Minnesota Genealogy Center, 1385 Mendota Heights Road, Mendota Heights, Minnesota, USA. Details. 10:00 am to 4:00 pm Minnesota Heritage Center Library, 1385 Mendota Heights Rd., Mendota Heights, Minnesota, USA. 10am to 4pm. Saturday 9 February: Using 1919–1922 Irish Army Records, with Malachi McRoe and Mervyn Hall. Host: Fermanagh Genealogy. Venue: Enniskillen Library, Halls Lane, Enniskillen. 1:30pm–3pm. All welcome. Members free / Visitors £5. No booking required.